Leadburn Gundogs run by Billy & Catherine Steel is based at Leadhills in the beautiful heather clad hills of South West Scotland where Billy worked for 30 years as a grouse moor gamekeeper whilst also pursuing his hobby of training and competing with his Labradors. All of Billy’s dogs must be able to do a full days work on the moor as well as compete in gundog competitions. 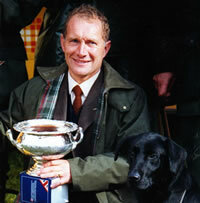 Billy has made up 11 Field Trial Champion Labradors and has qualified for the Retriever Championship 24 times. 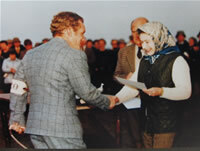 He has also represented Scotland at the CLA Gamefair International gundog competition on 19 occasions, winning top dog on 3 occasions with different dogs. One of those dogs was Jacob Bogdani of Leadburn who scored 100 out of 100, the only time this has ever been done. Billy is a kennel club A panel judge for retrievers and has judged the retriever championship twice; he has also judged the Irish retriever championship. Leadburn Labradors are chosen for temperament, trainability and game finding ability. It is no good having the best-trained dog if he cannot find his dinner, or the best game finder if he is not “with” you. (Or anybody else). A good dog is always a pleasure to be with and pleasing to look at. At the 2008 Retriever Championship, Billy's dog FTCh. Leadburn Viceroy was second and was the top male dog. At the 2014 Retriever Campionship, Billy's dog received the Lorna Countess of Howe Trophy and a Diploma of Merit.